Hiniduma Sunil Senevi, Senior Lecturer in Sinhala, University of Sabaragamuwa, spoke at a book launch. He didn’t deal with the text but as always he educated his audience. Sunil Senevi traced the history of the ‘English Poem’ in Sri Lanka. It was a revelation. He mentioned names I hadn’t heard of before. He located these names in terms of the temper and fervour of the particular period of history and the issues that the various poets concerned themselves with. He lamented that the English poet is a relative that the Sinhala Poet does not converse with. He did not say that the English Poet or rather the English Poetic Circle not only does not talk to the Sinhala Poet, but is by and large ignorant of the latter’s existence or, worse, even if aware is somehow dismissive, not account of quality-lack but some other malady. 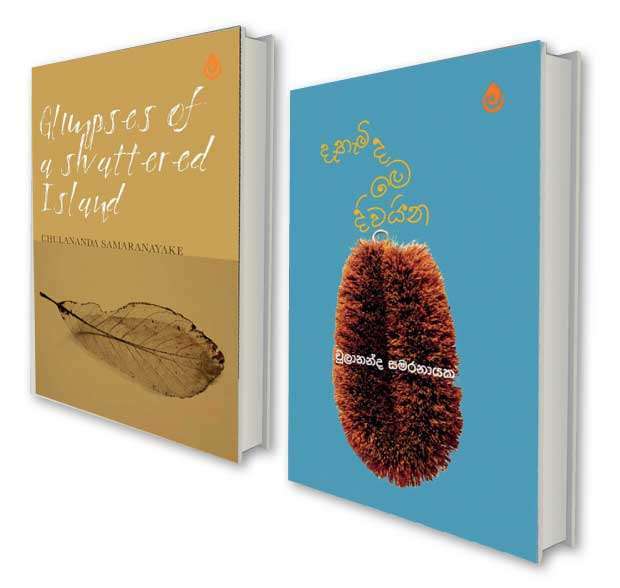 Book Review: (Dehamida Me Divayina’) and ‘Glimpses of a Shattered Island’ by Chulananda Samaranayake, Subhavi Publishers, 2017. The event saw the launch of two collections of poetry, ‘Glimpses of a Shattered Island’ and (‘Dehemida me divaina?’ or ‘Is this island really blessed?’) by Chulananda Samaranayake, a well-known translator and critic. The simultaneous launching may have persuaded people to believe they contain the same verses, one being the translation of the other, but this is not so. There is a similarity in the theme of course, but the collections, however, stand independently of one another. Chulananda’s poetry should be assessed regardless of historical context and the cultural fixations of the present pertaining to literature and the language(s) of literature. He is convinced that Sri Lankan society needs to be overhauled and that only a political struggle can set things right. This requires, according to him, people with open minds committed to political engagement rather than those who have suspended critical faculties on account of political affiliation. Dehemida Me Divaina is actually a query. ‘Is this island righteous?’ he asks and interestingly has a toilet bowl cleaner on the book cover, suggesting intent. He wants to clean up and part of that exercise is pointing out the dirt. There is criticism and satire in his poetry. Chulananda captures the pathos of those in the margins, the subalterns, the insulted and humiliated. That’s a theme that runs through the collection like a thread. The anti-establishment sentiment and antipathies to nationalism especially of the Sinhala Buddhist type comes laced with righteous anger (‘Arcade’), empathy (‘The prostitute’s lover at her funeral’), tenderness (in most of the poems), pain on account of injustice of all kinds, a dash of nostalgia and prescription. The poet is equally at home with the staid four-line rhyming format as he is with free verse. There are times when the strength of the poem is compromised by a tendency to detail and emphasize. The rhythm in the free verse gives more musicality and demonstrates command of the genre. It’s the activist that takes center stage through it all. it is yet to be found. The title ‘Glimpses of a Shattered Island’ is preface enough to the English poems. Comparatively, this collection seems more philosophical. There’s distance between poet and subject and yet the poems are consistent with the broad objective of political transformation. For example, a telling take on Mahinda Rajapaksa (obviously) points out the contradictions of the former president’s practices; he ‘starts the day listening to pirith’ moves to the FCID, addresses the media complaining about revenge-intent and then dabbles in suspicious money transfers even as blames the government for inefficient financial management. The ‘tiny shoe’ referred to was one at the bottom of a canyon (crater?) created by cluster bombs. As poignant and in this instance necessarily elaborated is the poet’s experiences of the 88-89 bheeshanaya and reflections on the same which he recounts more than two and a half decades later because he can now ‘write the answer not permitted that day’. For Chulananda, everyone is buried in a mass grave, ‘some in uniform and some in rags’ and it’s not just people. This collection is a welcome entrant to the world of English poetry written by Sri Lankans because it is at once a venturing to find fraternity even as it is a description of people, events, moments and things unseen, dismembered, misidentified or, if you want to be polite, ‘considered inconsequential, differently remembered, differently identified’.